Luckily I'm a guest, so I'm just making a cake! Cynthia Rodan's orange almond cake. I'm so behind.....I still have to shop. Luckily I'm hosting the 2nd night. At 8pm, the brisket was at 190F. A little low normally, but this beast is like butter, seriously, I can nearly spread it like nduja. Yield is not good on those prime briskets, though: the label was 15.36lbs, trimmed a couple pounds off the edge, final weight 7lbs even. JoelF wrote: Yield is not good on those prime briskets, though: the label was 15.36lbs, trimmed a couple pounds off the edge, final weight 7lbs even. This is nearly the same weight ratio I found with my corned beef. I started with a point cut near four pounds and yielded two pounds once it was finished. It may just be the nature of this cut of meat. So, for science, I did research: According to this site, brisket yields about 43%, so I'm actually beating the odds, and the prime didn't lose its weight due to excess fat, although the water pan was at least a quart of tallow this morning. I'm used to 12-16 immediate family members for Passover (no cousins). This year it's going to be only 5. My mom wants to cook everything as usual but not this time. One of us has major dietary restrictions from health issues which leaves 4. I'm on a special diet myself but I can still eat some of it. A very weird night. From what I hear at the minimum it's matzah ball soup (chicken available), brisket, asparagus, broccoli/peas/cheddar/crispy onions casserole, and dessert. 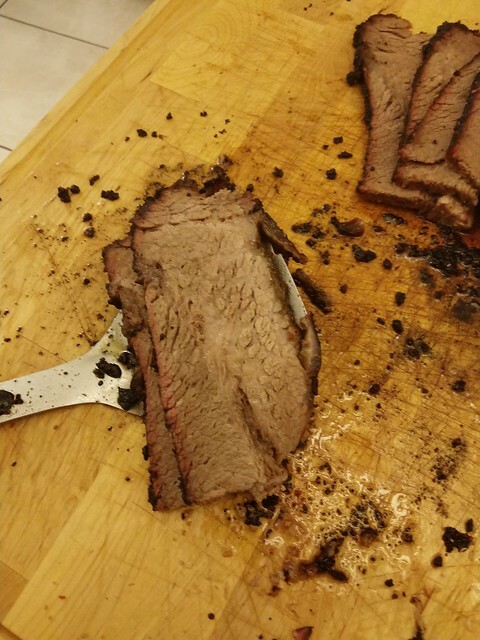 I wish our brisket was smoked like some of yours. Dinner was for 9 people, about half of whom had never before attended a Passover seder, but it was a hit with everyone, particularly a 3-year-old guest who got to hunt for the afikomen and Easter eggs, and got a chocolate bunny for finding the afikomen. It was not an easy or inexpensive dinner, and we have about a week's worth of leftovers, but I think we'll absolutely consider hosting one again next year. I have been tasked with gifilte fish and homemade horseradish sauce as usual. thinking of tackling homemade gefilte fish - recs? I PM'd you. I think my recipe is copyrighted and I cannot post here. annak wrote: thinking of tackling homemade gefilte fish - recs? See my recipe for my Aunt Louise's version above (post #11, p. 1 of thread). Easy to make and always a hit with everyone. I have to make extra for family members to take home after the Seder. embarrassing but true: i haven't made matzoh ball soup in ages and i'm looking for a recipe. this thread doesn't seem to have one - any faves to pass along? Smoked brisket, which is currently on the smoker in today’s ridiculous snow. We will finish it in the oven later this week, I think. PSA for those looking for Kosher for Passover pop: KfP Coke IN CANS is available at the Jewel on Howard in Evanston, also a variety of other canned pop including Canada Dry ginger ale, several types of Dr. Brown, Sprite, and Pepsi. annak wrote: embarrassing but true: i haven't made matzoh ball soup in ages and i'm looking for a recipe. this thread doesn't seem to have one - any faves to pass along? There is a thread devoted entirely to matzoh balls. Vegetarian broth worthy of matzoh balls with a link at the end to matzoh ball recipe from seriouseats. Our Seder will be so small this year, just 6 of us I think. I may just make a piece of fish to accommodate my brother and my son. Of course that will make it double fish- gefilte and dinner. It's going to be a hard one, being the first after my Dad passed earlier this month. He always loved the holidays.